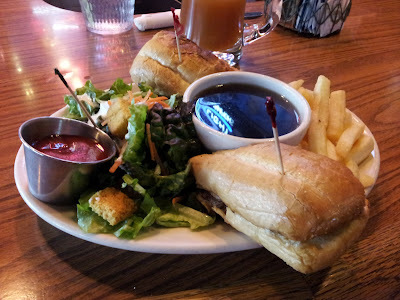 French Dip Reviews: 4 of 5 DeliciScore™ (Great) Awarded to The Pumphouse for their Burger Dip Sandwich in Bellevue, WA on this 28th day of March, 2012 - Always a solid, consistent product in Bellevue. 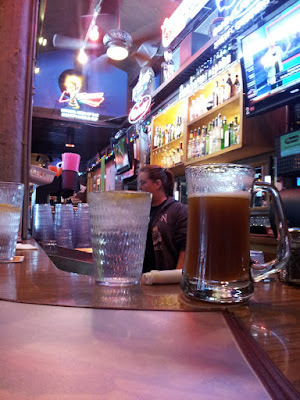 4 of 5 DeliciScore™ (Great) Awarded to The Pumphouse for their Burger Dip Sandwich in Bellevue, WA on this 28th day of March, 2012 - Always a solid, consistent product in Bellevue. El Burger dip. $9.99. Au Jus. No cheese. My view from my bar seat. That's a Mack & Jack's African Amber on the right. And yes, it was great. ketchup in a tin, good croutons. Hot, dark au jus. Here's the burger. It's good. Cooked medium well. A view of the somewhat overly toasted french roll. It's still good. Here's the tail-end of my dip. Just the perfect amount of sandwich to jus. 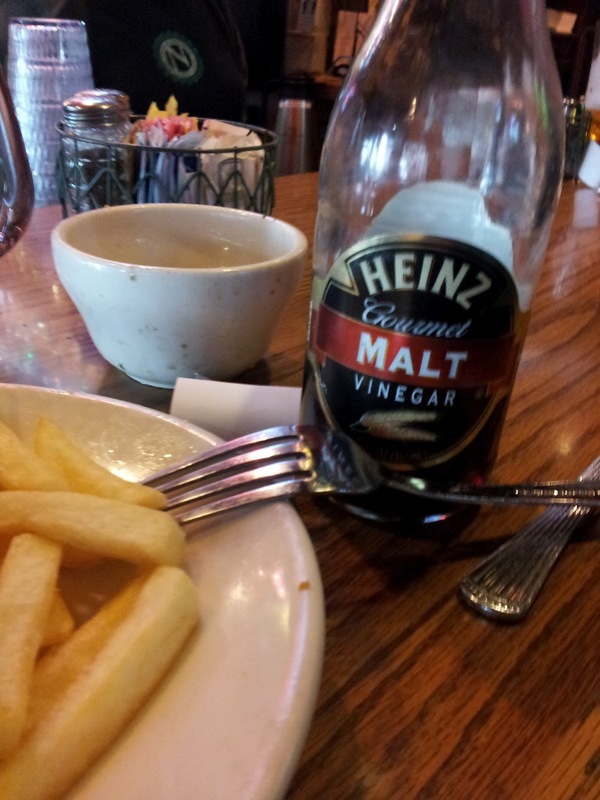 I really like putting Malt Vinegar on my fries. Even the salad gets a fancy toothpick. Bonus points for that!!! 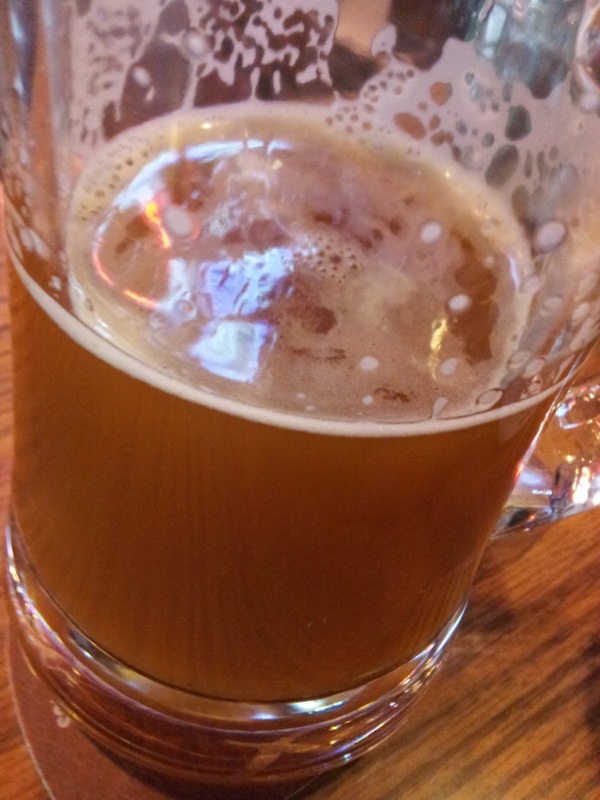 Mack & Jack's African Amber. It's great. 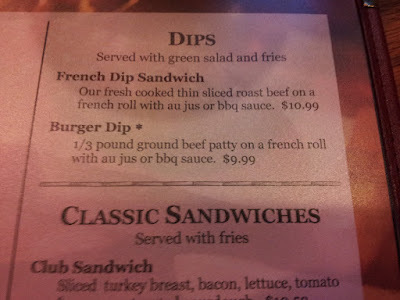 I really like burger dips. I might even say that I typically like them better than a roast beef dip....it just depends on the quality of the meat. 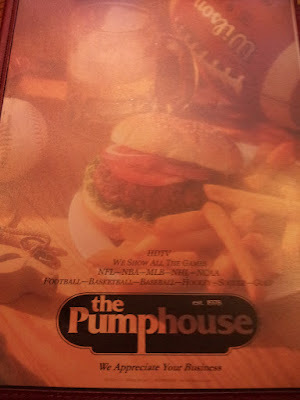 The Pump House makes a really solid burger dip. It's not as good as the Burger Dip from Kidd Valley, but it's still good. I found the sandwich to be really juicy with good beef. It is medium-small in size but Jessica thinks that it looks like it has a lot of meat. It's $10. There's no cheese or other topings with it so in that way it's a classic. 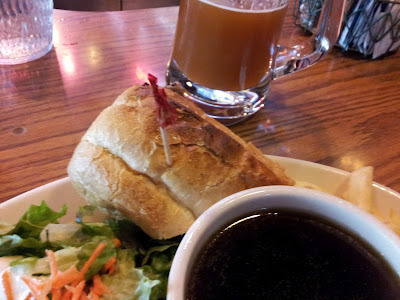 The au jus was hot and good. The buns were buttered, which added soemthing. 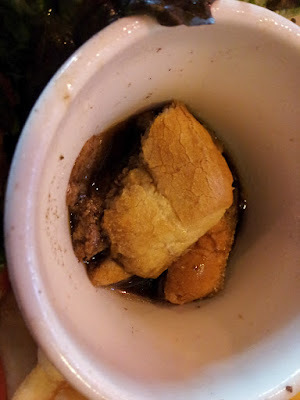 The au jus was the perfect amount. Overall, I give this Burger dip a 4. It has a good beefy flavor and is salty but the au jus is not overly salty. This meal really hit the spot for me during lunchtime. 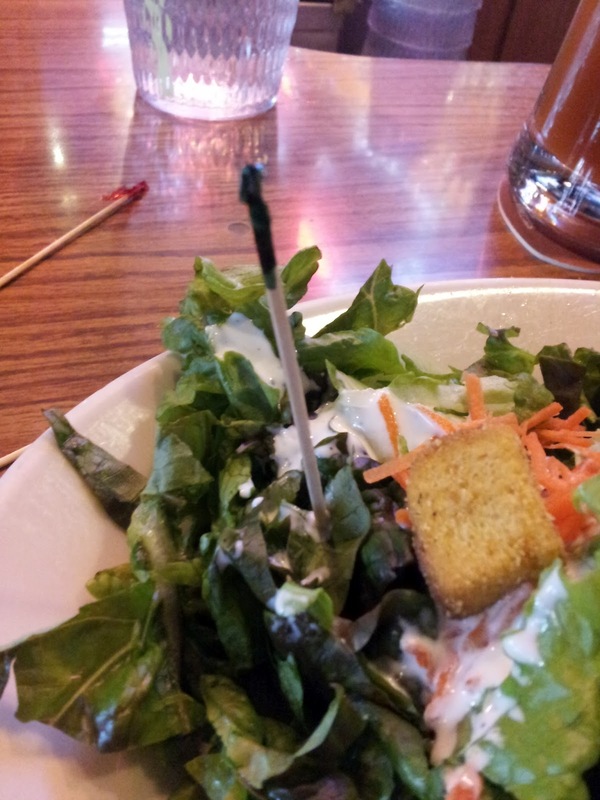 The salad has really great lettuce. The bleu cheese dressing is good and simple, neither thick nor runny. The overall meal could be a 5: It's a simple, perfect balanced lunch with the fries and salad. About the experience in total, I would say that the Pump House is operationally excellent and perfectly consistent in their delivery. This wins big points in my book. 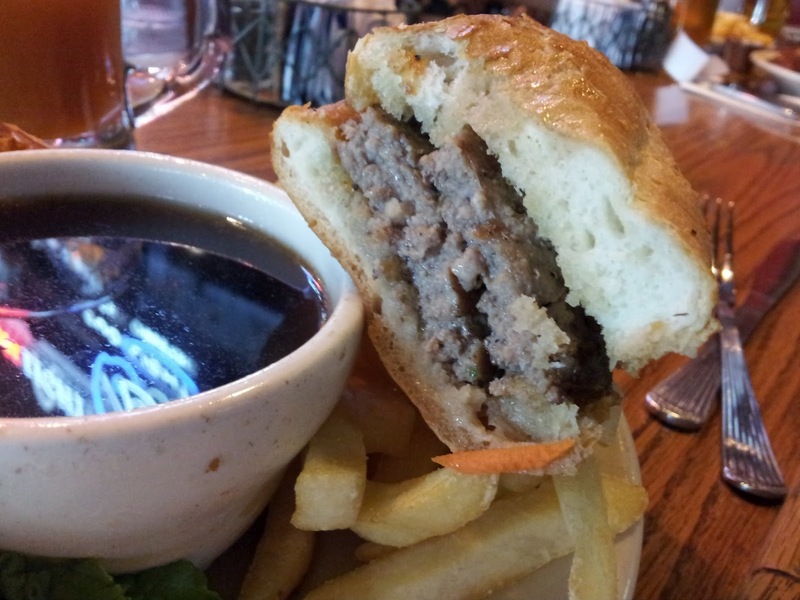 The Kidd Valley burger dip beats the Pump House dip because the Swiss cheese and garlic butter are great. If you take the meal overall, this is a better meal. Lemon in water in wide cup is real good.